Blackbirds follows the life of Miriam Black who has a singular gift (or curse) that means each time she touches someone she knows when and how they will die - vividly reliving their final moments. Still in her early twenties she's seen sights most people couldn't even imagine along with countless heart attacks, strokes, suicides, car crashes and that slow death by the big C.
When she hitches a ride with the big trucker Louis Darling and shakes his hand she sees that in just 30 days time Louis will be gruesomely murdered; what makes this even more personal, more terrifying is that he's calling her name just before he dies. Miriam has given up trying to save people as this only seems to re-enforce their demise but Louis will die because he met her and she will be the next victim. No matter what she does she can't save Louis. But if she wants to stay alive, she'll have to try. What immediately strikes you about this novel is the maturity of the prose, there is a very strong voice that is both confident and all it's own. This bleeds through to the characters too; the characterisation is without a doubt the real highlight of the novel, managing to create living breathing people with a few deft strokes of a pen. Miriam is about as far away from a hero as there is likely to be, unable to really cope with what she see's and just drifting along life's highway with no real purpose. But in a away she's also punishing herself; forcing herself to move on and inevitably meet new people and see new deaths where she could have quite easily just become a recluse and never gone out to touch people and relive new deaths. In a way it seems like she's trying to seek redemption for her own perceived failings and trying to uncover why she has been singled out. It must be said that this is an adult only book, not suitable for the younger reader and should be judged as such. There are no other genre tropes used other than Miriam's gift which creates a real sense of immersion and it's impossible not to be drawn into her world, the bond I created with her was much stronger than with most characters I read about and reading the novel is a real emotional investment. The story too is quite striking in it's non linear style, we of course have the fixed end point of Louis' death but no idea how it's going to be prevented or how the story will play out (at least to begin with). The three antagonists do bring structure to this though, and deliciously dark and twisted they are too, carving their own path through the story. 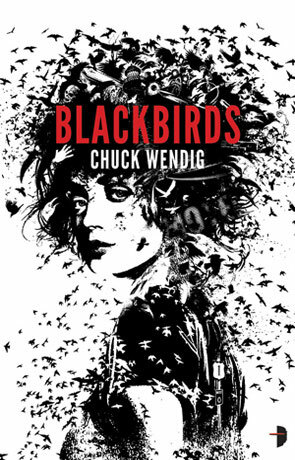 Blackbirds is another impressive title from the ever growing list of quality novels being published by Angry Robot Books, I hope that we get to see much more from the seriously talented Chuck Wendig. Written on 3rd February 2012 by Ant.